After Florida Gulf Coast reached the Sweet 16 and Wichita State reached the Final Four, teams outside of the college basketball power structure are starting to reach even footing. At least on the court. Beyond the major surprises in the NCAA Tournament, this is an interesting time for mid-major programs. The Mountain West showed surprising depth last season, a trend that should continue as the league expands. Even though Creighton left the Missouri Valley and Temple, Xavier and Butler left the Atlantic 10, there’s plenty to watch in both leagues. The first win for a No. 16 seed over a No. 1 seed will have to wait. At least until tonight or tomorrow, if not next season. Southern gave Gonzaga a scare keeping its round of 64 game close all the way to to the end in a 64-58 loss Thursday. Southern had the game tied at 56 with 3:47 remaining before guard Kevin Pangos led Gonzaga’s comeback with seven of the Bulldogs’ last 10 points and an assist on Gary Bell Jr.'s three-pointer. The whirlwind travel schedule finally caught up to Saint Mary’s. After traveling from Moraga, Calif., to Dayton on Monday to defeat Middle Tennessee in the First Four on Tuesday, the Gaels skipped out of Ohio to go to Auburn Hills, Mich., against Memphis. Daily March Madness Tracker: Virginia off the bubble, Gonzaga a No. 1? Read more about Daily March Madness Tracker: Virginia off the bubble, Gonzaga a No. 1? College basketball debate: Who is the nation's top point guard? As college basketball’s regular season and conference tournament season nears a close, Athlon Sports will keep you up to date on the key developments through the week. Each day brings key developments for the NCAA Tournament, so in this space, we’ll update which teams look to be in the field, which might be playing themselves out as well as the key games of the day. 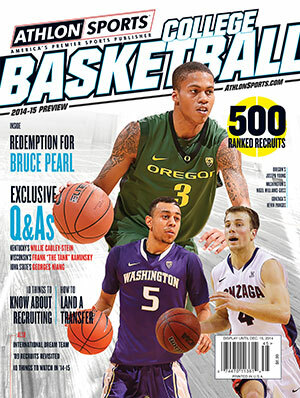 Read more about College basketball debate: Who is the nation's top point guard? In a college basketball season marked by uncertainty, determining the nation’s top players at any position is a tall task. For most of the season, the college basketball power rankings have been fairly consistent at the top: Two or three teams from the Big Ten, a team or two from the state of Florida, maybe Duke and/or Kansas every now and then. Some of those trends remained true this week with Indiana and Michigan taking the top two spots and Miami sitting at No. 5. But the top four has a few newcomers. Michigan State moves into the top three. Could Sparty claim No. 1 this week? Another week, another Big Ten showdown with national implications. With a five-game win streak including last week’s 75-52 rout of Michigan, Michigan State has gone from sneaky Final Four contender to potential No. 1 seed. The Spartans, who moved from No. 9 to No. 3 in our rankings this week, will have their chance to test that in their second meeting with Indiana this season. NCAA Tournament Report Card: Villanova, in or out? Another week, another No. 1 in the Athlon Sports college basketball power rankings. For the third week in a row, we have a new team in the top spot following Duke two weeks ago, then Michigan. We return to an old friend at No. 1 in Indiana, who defeated the Wolverines 81-73 on Saturday. Miami’s 90-63 drubbing of Duke last week shuffled the power rankings in more ways than one.